Why didn't Comsat Angels, critically-adored post-punks, "make it"? Maybe because they tried to. Here, a second set of deluxe reissues includes a rarities compilation, plus the 1990s output that earned them back their cred. Comsat Angels belong to a sizeable group of post-punk guitar band shoulda-beens who got a bad deal in their time. Despite critical acclaim and devoted cult followings, these bands suffered through bad luck with record labels and indifference from the buying public, with nods from subsequent, more successful bands the only consolation. A few, like the Church, the Go-Betweens, and the Chameleons, turned their small-scale status to their advantages, manufacturing fruitful second acts. But many, such as the Sound, the Wild Swans, Kitchens of Distinction, Swervedriver, and Catherine Wheel, simply faded away. Comsat Angels took a third approach, one that's easily overlooked by fans who cite the band's relative lack of respect: After three critically-heralded but commercially lukewarm albums, they spent most of the 1980s shamelessly remaking their sound in a quest for American stardom. At one point, they even changed their name. But, unlike the Psychedelic Furs, whose sound theirs most resembles, Comsat Angels never even had a hit single to show for it. As novelty t-shirts go, theirs would have read "We sold our souls to the '80s and all we got was a lousy song on the Real Genius soundtrack." As it did for the Sound and the Wild Swans, England's Renascent label has stepped in to rescue Comsat Angels from history's dustbin. Last year saw deluxe reissues of those first three classics, and this trio completes the vault-emptying process with 1992's return-to-form My Mind's Eye, '95 swansong The Glamour, and To Before, a newly-assembled collection of outtakes and rarities. Before splitting, the band disowned its 1983-1990 output. A bit strange, then, that that's the era To Before draws most heavily from. To be fair, about a quarter of the two-disc set covers the band's early years, revealing a band still trying to find its feet. 1979's debut "Red Planet" EP, included in full, alternates snappy new wave (check the cowbell on the title track!) with artful meandering that more accurately predicts the Comsats' signature sound. A few songs reveal that sound fully-formed -- chilly, atmospheric guitars and keyboards hinging on Kevin Bacon's (no relation to the actor) thundering bass grooves and Mik Glaisher's drumming, which often leans toward the tribal. "Have You Seen" and the quasi-reggae, Talking Heads-influenced "The House That…" are the strongest of the compilation. But the lasting impression of To Before is how, along with producer Mike Howlett, the Comsats tried to morph into a watered-down Flock of Seagulls/Simple Minds amalgam, synth and synth-drum heavy with occasional delay-pedaled guitars. "You Move Me" is a pretty good '80s new wave anthem, but that's about it. Even worse than the synth-pop, though, is the circa 1990 material released under the band name Dream Command. Kudos to bandleader/compiler Steve Fellows for having the humility to actually include three pieces of horrible, booming, pseudo-serious alt-rock from the Fire on the Moon album. What, other than lack of direction and shame, could have made Comsat Angels want to turn into Mr. Mister? Finally, "There's Something Going On" reveals that the band briefly considered jumping on the UK indie-dance bandwagon in '91. This is definitely not the way to be introduced to Comsat Angels. My Mind's Eye, however, may be. Against the odds, the album summons the entire delicate atmosphere that the previous decade's worth of material had been largely missing, while avoiding the suffocating bleakness of some of the earlier work. From the opening squall of feedback to Fellows' reclamation of his effortlessly, elegantly wasted croon, "Driving" almost single-handedly makes up for the lost years. It's a statement of confidence and renewed focus that's further validated by the strength of what follows. A deceptively diverse album, My Mind's Eye encompasses airy space-outs like "Always Near", "Shiva Descending", and "I Come from the Sun", the pure guitar pop of "Field of Tall Flowers", and more muscular rockers like "Beautiful Monster" and the title track. True, "Route 666" skirts with self-parody (as if Dream Command hadn't already done that), but the previous seven tracks confirm a stunning artistic resurrection. 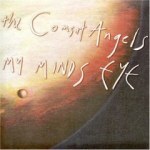 In the long run, though, by finding their guns again and sticking to them, Comsat Angels created something timeless. Another comedown seemed inevitable, and The Glamour does a fine job of avoiding one. Recorded after the only lineup change in the band's 16-year history (Bacon was replaced and a second guitarist added), it's a bit heavier, a bit more obvious, a little less magic. Here, it's been expanded from a single disc to a double with the addition of seven tracks, five of them previously unreleased. Fellows claims this new version is "closer to how it should have been," and it's hard to argue. "I Hear a New World" creeps along seductively, while "Sailor" and "The Naila Game" showcase the moody guitars that initially earned the band comparisons to the Cure. "Valley of the Nile" almost matches "Shiva Descending" for Eastern-flavored enchantment. A reference to Kurt Cobain's death is made in the original liner notes, and indeed, "Goddess", "Audrey in Denim" and the title track skirt as close to grunge as the band's guitar effects would allow. If a song title like "Psychedelic Dungeon" sounds too obvious, that's because it is, and too much of disc two sounds like mood-rock-by-numbers to make The Glamour an unqualified success. Still, it ensured the band exited on a relative high. As is always the case with Renascent releases, these reissues sport classy, careful packaging and sound, and the bonus tracks and Fellows' direct involvement ensure they render the previous versions obsolete. The two studio albums are credited as being produced "by sheer force of will" and "by no one", and at times sound like it -- tinny and slight. But, after the Comsats' 1980s, who could blame them? In the end, they got their souls back.